Douglas C-53D Skytrooper - N45366 - "D-Day Doll"
C-47s in British and Commonwealth service took the name Dakota, from the acronym "DACoTA" for Douglas Aircraft Company Transport Aircraft. The C-47 also earned the nickname Gooney Bird during the European theater of operations. The USAF Strategic Air Command had C-47 Skytrains in service from 1946 through 1967. After World War II the U.S. Navy also structurally modified a number of the early Navy R4D aircraft and re-designated the modified aircraft as R4D-8. 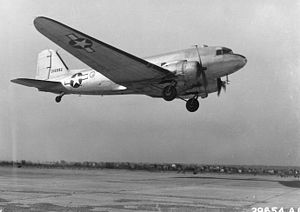 The C-47 was used by the Americans in the initial stages of the Berlin Airlift and was subsequently replaced by the C-54. The US Air Force continued to use the C-47 for various roles, including the AC-47 gunships - code named Puff the Magic Dragon or Spooky - and the EC-47N for electronic reconnaissance during the Vietnam War. The Royal Canadian Air Force also adopted the C-47 for use in search & rescue operations throughout the 1940s and 50s. Postwar, thousands of surplus C-47s were sold and overhauled and modified for civil airline use, some remaining in operation in 2008. Initial military version of the DC-3 with seats for 27 troops, 965 built including 12 to the United States Navy as R4D-1. C-47 with a 24-volt electrical system, 5,254 built including USN aircraft designated R4D-5. C-47A equipped for photographic reconnaissance and ELINT missions. C-47A equipped for Search Air Rescue. Redesignated HC-47A in 1962. C-47A equipped for VIP transport role. Powered by R-1830-90 engines with superchargers and extra fuel capacity to cover the China-Burma-India routes, 3,364 built. C-47B equipped for VIP transport role. C-47 tested with Edo Model 78 floats for possible use as a seaplane. C-47B with superchargers removed after the war. Gunship aircraft with three side-firing 7.62 mm Minigun machine guns. C-47D with equipment for the Airborne Early Warning role. Prior to 1962 was designated AC-47D. C-47D equipped for photographic reconnaissance and ELINT missions. C-47D equipped for Search Air Rescue. Redesignated HC-47D in 1962. C-47D equipped for VIP transport role. Modified cargo variant with space for 27-28 passengers or 18-24 litters. YC-129 re-designated, Super DC-3 prototype for evaluation by USAF later passed to USN as XR4D-8. C-47H/Js equipped for the support of American Legation United States Naval Attache (ALUSNA) and Military Assistance Adivsory Group (MAAG) missions. C-47A and D aircraft modified for ELINT/ARDF mission. N and P differ in radio bands covered, while Q replaces analog equipment found on the N and P with a digital suite, redesigned antenna equipment, and uprated engines. One C-47M modified for high altitude work, specifically for missions in Ecuador. Designation applied to aircraft modified to a Basler BT-67 standard. Various DC-3 and DST models, 138 impressed into service. Various DC-3 models, 14 impressed. DC-3A aircraft with R-1830 engines, 5 impressed. Troop transport version of the C-47. One aircraft with full-span slotted flaps and hot-air leading edge de-icing. Winterised version of C-53 with extra fuel capacity and separate navigator's station, eight built. C-53 with larger port-side door, 17 built. C-53C with 24V DC electrical system, 159 built. Three redesignated C-117s used in the VIP role. One C-117C converted for air-sea rescue. Super DC-3 prototype for evaluation by USAF redesignated C-47F and later passed to USN as XR4D-8. One C-47 tested as a 40-seat troop glider with engines removed and faired over. USN version of the C-47. Twenty C-53Cs transferred to USN. C-47A variant 24-volt electrical system replacing the 12-volt of the C-47. Redesignated C-47H in 1962, 238 transferred from USAF. R4D-5 for use in Antarctica. Redesignated LC-47H in 1962. R4D-5 for use as special ECM trainer. Redesignated EC-47H in 1962. R4D-5 for use as a personnel transport for 21 passengers and as a trainer aicraft. Redesignated TC-47H in 1962. R4D-5 for use as a special ASW trainer. Redesignated SC-47H in 1962. R4D-5 for use as a VIP transport. Redesignated VC-47H in 1962. 157 C-47Bs transferred to USN, redesignated C-47J in 1962. Variants as the R4D-5 series, redesignated LC-47J, EC-47J, TC-47J, SC-47J, and VC-47J respectively in 1962. 44 TC-47Bs transferred from USAF for use as a navigational trainer. Redesignated TC-47K in 1962. R4D-5 and R4D-6 aircraft fitted with modified wings and re-designed tail surfaces, Redesignated C-117D in 1962. R4D-8 converted for Antarctic use, redesignated LC-117D in 1962. R4D-8 converted as crew trainers, redesignated TC-117D in 1962. R4D-8 converted as a staff transport, redesignated VC-117D in 1962.